This bed is so beautiful and very well made. We are very happy with this purchase. Serene, sophisticated, and sturdy, this bed is a chic and cozy addition to any bedroom. The walnut veneer finish is perfectly matched to grey polyester upholstery for a pristine and polished look sure to be a favorite design element for years to come. This bed is absolutely gorgeous! I had it saved on my Pinterest account for months as I shopped for a new mattress and I was so bummed when the gray version sold out. This ended up being a blessing though because the cream colored one is just perfect for my home. It matches my bedroom perfectly and I am just so pleased with it. Putting the bed together was a challenge for my husband and me. The bed legs aren't secured fully until the side rails are attached to the headboard/footboard pieces so they kept shifting as we were trying to screw everything in. So I was balancing the wood pieces while my husband attached the pieces. Maybe it's just our overall clumsiness but it was definitely a lengthy process and I think we're generally pretty handy people. So when the bed was finally assembled it was so solid. Nothing shifted or wobbled at all. Once we put our new king mattress on top and got onto it, I was amazed by the firm base this frame provided. For anyone who has said this isn't a high quality bed, they're nuts because the wood is very solid and a heavy quality overall. The headboard is tightly bound so there is zero chance that it will unravel at all. Unless someone is taking a hammer to this frame, this thing should hold up for years and years without any issues. My one problem with it are the gaps along the sides. It is oversized compared to the mattress, but we like to tuck our bedding in and this actually works in our favor for the thick down comforter we use. It fits perfectly and looks so clean. Anyone on the fence about this should jump at the chance to grab this frame. 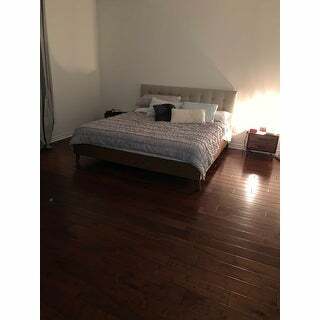 Platform beds of this size and quality usually sell for three times the price. You just can't beat this quality for this price anywhere. 5 huge stars! I only have one problem. The bed doesn't fit perfectly. I have about a 3in gap on both sides of the bed. It is my fault for not checking the dimensions that is why I gave it 3 stars not 5. Typical King size is 76in wide. This bed frame is 80.5in wide. Why the extra 4.5 inches i do not know. Please be mindful of that when purchasing this bed. Besides that The bed is great. Strong materials used.Overall happy just an eye sore with the gap. Great quality for the price! The first bed we received had holes that didn't line up in the headboard and there wasn't a way to fix it so we called and they quickly sent us a whole new bed. The second headboard was perfect and we were able to assemble it easily. Assembly definitely requires 2 people but it wasn't that bad with a little patience! Now that it is all set up with our new mattress, we are very happy with it! It looks high-end compared to other more expensive beds we looked at in furniture stores. Our new king Amerisleep foam mattress (76"x80") fits the frame perfectly so I'm not sure why other reviewers were having issues with the width. Maybe foam mattresses "spill" over some creating more width?? Nice and beautiful, fits my bedroom style. It goes well with all kinds of bedding. Pain to assemble cause they have some holes not lined up and I have to literally drill a hole to make it. And please be attention of the width of the frame! It’s wonder than regular king size. I’ve got gaps each side for 3 inches. I’m still trying to find a way to fix this problem… otherwise it’s a nice bed overall. Love this bed. We bought a Tuft and Needle mattress and this bed fits it perfectly. The wood is good quality, and the fabric is the color is described. The fabric is also good upholstery fabric, and the tufting is actually pulled through, not just made to look like it is. The only reason I wouldn’t give it 5 stars is the assembly. I was not able to put this together myself, and you definitely need a power drill or else it will take you hours to screw everything in by hand. Other than that, the construction is sturdy and has held up the month that we have had it. 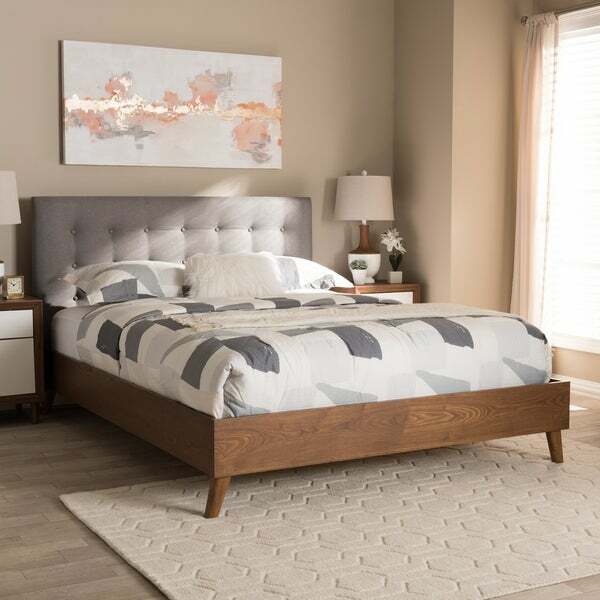 This bed frame is an amazing value for the cost! Highly recommend others to choose this bed for their home. I have to admit that it definitely takes two people to put it together. I imagine it being very complicated for one single person to put it together. The instructions were not written well, so I'm glad we are construction inclined! Despite such, we picked this bed because it fits our mid-century modern/industrial aesthetic and we were not disappointed. Great bed - love it! We got th beige collie and it is true to the photo as well as the wood coloring. Took myself and my husband about an hour to put together, you do need 2 people at some stages to lift the pieces into place while holding the frame - instructions are pretty clear and easy to follow. Would recommend using an electric screwdriver as there are a lot of screws and doing it by hand would be tiresome and take a lot more time. It’s solid and looks great - really good finish to it. The bed arrived well ahead of time (two days prior to the originally scheduled delivery date) and it was absolutely seamless! It is still boxed and waiting for my move to happen, so very exciting to add this amazing looking bed to my new bedroom! We love this bed frame and headboard! It was easy to put together and it suits our bedroom so well! I would highly recommend it! The colors are perfect and the materials are well made. Terrible shipping of this product. It came in multiple shipments, and was missing so much that it was sitting around for over a week. Ended up returning. Whole thing was a hassle. Really sturdy and well done, it looks great, we love it. Not too much height, but for us it’s perfect because our toddler goes by herself in and out. To assemble it it’s better two persons, and it’s very heavy. Love this bed!!! 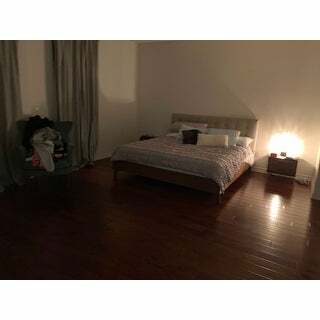 It is such a beautiful bed. I love my new bed! I got it in beige. I was a little difficult to put together. Just make sure that you have someone else helping. At first, it didn't seem too stable, but once it was all put together is was pretty sturdy. Love love love this bed BUT it had a large gouge on one of the boards and was scratched on another. I’m going to see if we can get the boards replaced so we’ll see how the customer service goes. "What is the maximum weight the king size bed will hold?" The weight capacity of the King is 600 lbs. "Does this fit a standard King size mattress? I've seen a few reviews saying it has gaps." The mattress should be approximately 76 inches wide x 80 inches deep. "Hi, I would like to know about the hight of the headboard . In the description it's say : Headboard: 43.7 inches wide. Is it from the ground to the top of the headboard or the headboard only ? Thanks"